From Hull to Paris, 4 countries and 4 days of riding await on this fantastic ride through Northern Europe. 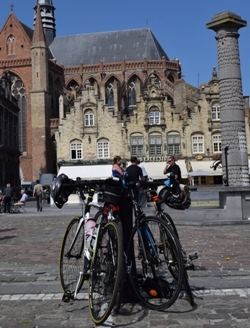 We'll get to ride along the dutch coast, experience an evening in the incredible city of Bruges before riding across North East France from Roubaix all the way into Paris! After a meet and greet in Hull it's straight onto the ferry for an overnight crossing over to Rotterdam where the adventure really begins, Day 1 focuses mainly on riding down the Dutch coast, you'll experience riding across vast dams/dykes and through the impressive Dutch cycle network on the way to Bruges. With an overnight in the charming Belgian city of Bruges its then on into France, we may even find a few sections of cobbles that make this area rich in cycling history! The 3rd day is a possibly the most challenging with 123kms to ride, plenty of pretty french countryside awaits! The final day is one of our all time favourites, we'll set off relatively early from Beauvais and have a gorgeous ride through to Paris, we'll head past the Arc du Triomphe and Champs Elyssee before finishing at the Trocadero! Congratulations on completing this fantastic ride! Pre-Event Meet at designated location for pre-event briefing. Make our way to the ferry and board for an overnight crossing to Rotterdam. Upon departing the ferry, we'll head through Oudorp and across to Zeeland, with plenty of stunning views over the water; this is a unique experience and one to rememeber! In the afternoon we have a short ferry crossing Breskens before turning inland and riding to the overnight stop in Bruges, Belgium; one of our favourite cities in Northern Europe with plenty to explore, good drink on tap and fantastic food! By Midmorning we'll depart Belgium and ride into France (Country number 4!) and home of the 1 day classics, riding near Roubaix we may find some cobbles to test your mettle on and ride in the wheel tracks of legends! With a lunch stop in Lille the afternoon is prodomintatly based on the Canal D'Aire so expect miles and miles of flat traffic free riding! Today we have more beautiful French countryside and quiet roads... we'll blast across rolling fields as we head ever closer to the capital! Arriving at lunch in the nice town of Amiens, we'll have lunch next to the Amiens Cathedral an incredible structure overlooking the River Somme. The afternoon is much of the same with classic little villages and rolling countryside. A gorgeous final day as we head through ancient forest between Ablainville and Pontoise. Pontoise is our final rest stop before heading into Central Paris, we'll cycle along the Seine before a quick lap of the Arc du Triomphe and along to the trocadero for a celebratory photo with the Eiffel tower in the background! You then get the late afternoon to explore before dinner in a nearby classic french restaurant.